HARTFORD CT—The mold started in the basement. But it soon spread to every corner of Rondesha Brooks’ government-subsidized apartment, covering the walls of the living room, the back of the couch and even her daughter’s shoes. The stench quickly filled the house, and Brooks, 28, feared for her daughter, who is 12 and has asthma. It’s not safe to live in,” said Brooks, who works as a cashier at a fast-food restaurant. A federal housing inspection in February confirmed living conditions were abysmal — not just in Brooks’ home, but throughout the 52-unit Section 8 development known as the Infill apartments. The property scored only 27 points out of 100, far below the 60 points needed to pass the mandatory health and safety inspection. But more than nine months after the inspection, federally mandated deadlines for action have come and gone, and residents say little has changed. The black mold keeps spreading beyond the thin coat of paint that the landlord recently put on Brooks’ walls and is now creeping up her couch, no matter how much she cleans. Next door, roaches crawl all over her neighbor’s kitchen, where the ceiling collapsed this summer; the neighbor struggles to keep bedbugs from biting her 1-year-old granddaughter. But more failing properties also mean that HUD has a bigger caseload of troubled homes to oversee. And rather than beefing up the department’s staff to oversee them, HUD has lost hundreds of staff members in the wake of a hiring freeze mandated by President Donald Trump. HUD’s enforcement office, tasked with going after the worst landlords, now has the lowest staff levels since 1999, according to a federal watchdog. At the same time, Carson has proposed raising rents on poor families, requiring them to pay a higher percentage of their income for housing, and the Trump administration has pushed — so far unsuccessfully — for steep budget cuts. The staff cutbacks have made it more difficult for the department to identify and fix problems quickly, current and former HUD employees say. While tenant advocates have long criticized HUD’s oversight as being too lax, a dozen current and former HUD officials — both political appointees and career staff — also describe a climate of inertia under Carson that they say is undermining the department’s work. “There’s no urgency on anything,” said a current HUD official who asked not to be identified for fear of retribution. A slow response by HUD, while not uncommon in government agencies, can have serious repercussions for the children, elderly and disabled who make up the majority of those living in taxpayer-subsidized housing. In one of Hartford’s poorest neighborhoods, a three-month investigation by NBC News found that HUD failed to comply with federal laws requiring prompt action against the owner of a property that authorities knew was unsafe, unhealthy and in disrepair, according to documents released through the Freedom of Information Act. HUD says that it is making an aggressive effort to go after delinquent landlords. “The department is under new marching orders from Secretary Carson to redouble our enforcement against those who violate our rules,” said HUD spokesman Jereon Brown. But tenants here say they feel trapped in decrepit homes with nowhere else to go. Their rental assistance is tied to the property, so they can’t take their subsidy elsewhere. The Infill buildings are scattered across Hartford’s North End, a predominantly black neighborhood where nearly half of the residents live below the poverty line. Under the Obama administration, HUD singled out the neighborhood for federal help, citing the North End’s “alarmingly high rates of unemployment, violent crime and food insecurity” in 2015. Low-slung houses, corner stores and abandoned lots still surround the Infill apartments, where residents live in two-story units covered in brick and white siding. On paper, they are the kind of privately owned, publicly subsidized properties that Carson has championed as the solution to the country’s affordable housing crisis. Under the Section 8 affordable housing program, tenants typically pay 30 percent of their income toward rent, and taxpayers make up the rest. Infill’s landlord is guaranteed over $700,000 in rent for the entire property each year, according to documents released through the Freedom of Information Act and obtained by NBC News. But relying on private landlords still requires HUD resources and staff to ensure owners are delivering what they promised to taxpayers. And HUD officials have acknowledged that even when these buildings fail physical inspections, HUD is slow to cancel contracts or impose fines on delinquent landlords — reluctant to force tenants out of their homes and fearing that landlords will pull out of the Section 8 program altogether. Instead, HUD generally tries to accommodate landlords who promise to make fixes, even if they are slow in coming. In the case of Infill, though, HUD acknowledged that the landlord failed to deliver. “The owner provided certain assurances to our field folks that, in the end, did not happen,” Sullivan said in an email. That hasn`t stopped the federal subsidies. It`s a flow of money that continues to come, said AJ Johnson, a local pastor who has helped the tenants organize. Living conditions at the Infill apartments deteriorated after new owner Blima Isaacson and manager Eli Fish took over the HUD-subsidized buildings in the summer of 2016, more than a dozen tenants told NBC News. Pierre, who works full-time for Hartford’s education department, said she tries hard to make a home for herself and her 9-year-old daughter, filling the space with family photographs and houseplants. Upstairs, her daughter’s room is decorated in pink and purple, matching her favorite toy — a Barbie dream house. But, Pierre said, she feels powerless against the mold that grows in the basement and across the ceiling of her bathroom. The previous landlord had kept the mold at bay by spraying the walls with bleach, Pierre said. That’s what her daughter’s medical provider had recommended after determining that the girl`s asthma was triggered by mold and mice, medical records show. The property dropped from 91 points in a November 2014 inspection to 27 points this year, according to HUD records. This should have set off a tight timeline of responses under legislation Congress passed in 2017 and renewed in March, prompted by grim conditions in other Section 8 buildings. Instead, HUD and the landlord missed one deadline after another. HUD began the process by issuing a failed inspection report to Infill’s owner on Feb. 2, according to records released through the Freedom of Information Act and obtained by NBC News. HUD was then required to follow up within 15 days to notify Infill’s landlord that he was in default of the contract and give him a deadline for correcting all problems. But HUD didn’t issue that notice until early May — 96 days later. When it finally sent the notice, which was addressed to Fish, HUD informed him that he had 60 days to “correct all physical deficiencies” at Infill, or else face further action by HUD. But Fish took more than twice as long — 131 days — to certify that he had fixed all problems, according to HUD documents obtained by NBC News. HUD says Infill’s owner moved more quickly to fix exposed wires, missing smoke detectors and other serious violations, according to a HUD visit in mid-February. But in June, July and August, city inspectors found rampant infestations of bed bugs and mice, according to inspection reports obtained by NBC News that detailed dozens of violations. The city also cited Infill for missing smoke detectors and electrical hazards — the types of urgent safety violations that HUD claimed had been fixed months earlier. HUD characterized the delays as typical. But they fly in the face of legislation that Congress passed to speed up and toughen HUD’s response to failing properties — changes that HUD has inserted in its official guidance. The worst cases are handled by HUD’s Departmental Enforcement Center, which can use everything from monetary penalties to the replacement of property managers to get delinquent landlords in line. When pressed to explain the protracted delays, HUD said that cases like Infill’s can often take more time, not less. “As always, when the DEC becomes involved, more time is needed to determine an enforcement approach,” said Sullivan, the HUD spokesman, referring to the Departmental Enforcement Center. In the meantime, tenants say they’ve been left with damaged windows, vermin, mold and faulty heat. One tenant said she had been complaining about a leaky kitchen ceiling “for months” to Fish before it collapsed completely in July, terrifying her family. The landlord finally patched up the hole. But water continues to leak throughout the Infill properties, tenants say. During a recent downpour, Ashley Matos rushed into her son`s bedroom to mop up the water that had leaked in through his window. She called the landlord but says it took weeks to get a response. We have to go chase him, Matos said. At another Section 8 property in Hartford, Fish repeatedly failed to comply with HUD requests to clean up a building where a child under the age of 6 had tested positive for lead poisoning under a previous owner, according to documents obtained by NBC News. When approached by NBC News at one of his Infill buildings, Fish waved off questions and drove away in his car. Isaacson, who shares a Brooklyn home address with Fish according to public records, did not respond to requests for comment. HUD officials have admitted that they don’t have the resources to keep close tabs on the tens of thousands of subsidized properties they oversee. In Hartford, just up the street from Infill, a Section 8 property run by another landlord passed inspection in February despite holes in the ceiling, rampant mold and other serious problems. Meeting privately with irate tenants in early October, HUD officials blamed an inspection process that can result in inflated scores from contract inspectors, despite recent reforms. When tenants asked at the meeting why HUD hadn’t followed up sooner, the HUD official said the department didn’t have the capacity. “We just don`t have the staff for it,” he said, according to the recording. “There are 432 properties in Connecticut alone and I have — I have five staff,” his colleague added. “When something is brought to our attention through Cori or you all, we can say, ‘Wait a minute, we need to take a look,’” the first HUD official told Hartford tenants, according to the recording. HUD’s staffing shortfalls extend well beyond Connecticut. HUD has shed more than 480 staff members since the end of the Obama administration, according to government records, in part due to the hiring freeze Trump implemented when he took office. The department’s enforcement office has been losing staff for years, but it’s reached a two-decade low of 90 employees under Carson, according to data provided to NBC News by the Government Accountability Office. The watchdog also found that work completed by HUD`s enforcement office dropped by 25 percent since 2016 and criticized HUD for failing to keep track of its caseload. When asked for enforcement data that HUD is required by law to provide to Congress — totaling the actions taken on failing properties — HUD said it could not provide reports before November 2017 because it had never compiled them. Meanwhile, in HUD’s regional offices — which are on the front lines of monitoring troubled properties — current and recently departed officials say that they have struggled to fill positions and that caseloads have spiked. HUD admits that “we are leaner than we used to be” but Sullivan, the spokesman, said the department is in the process of bringing on 77 staff members to the Office of Multifamily Housing, which oversees the contracts for multifamily rentals, and is recruiting for 48 vacant positions. The department added that it is conducting a “wholesale re-examination” of the inspection process and recently released new guidance meant to strengthen its oversight of HUD-subsidized apartments. But HUD issued its first news release on the inspection overhaul and its new guidance only after weeks of questions by NBC News. Carson, meanwhile, has other priorities: He recently suggested rolling back inspection requirements, rather than strengthening them, to encourage more landlords to participate in the Section 8 voucher program and has stressed the need to encourage “self-sufficiency” by raising rents on all Section 8 tenants. Pierre is grateful for a place that she can afford while she works as a speech therapist and earns her bachelor’s degree in psychology. Her plans for the future include getting a master’s and, one day, owning a home. But she worries constantly about how the mice and mold will affect her daughter’s health. Infill’s owner, meanwhile, is set for years to come. In July 2017, just seven months before the failed inspection, HUD renewed its contract with Isaacson for 20 years — a deal worth over $14 million. 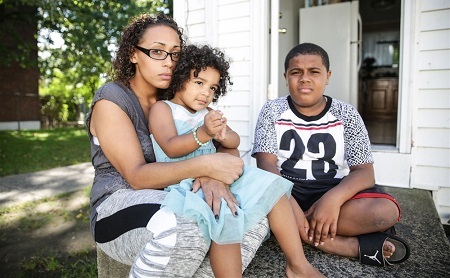 Photo: Ashley Matos sits with her daughter Izabella, 3, and son Jayden, 9, outside their home in Hartford, Connecticut. The apartment, subsidized by the Department of Housing and Urban Development, is infested with mold and rodents and has other serious problems, including a leak in her son`s bedroom that empties onto an electrical outlet when it rains. Source: Hannah Rappleye / NBC News.